An Egyptian military formation in April 2017 (photo via U.S. Secretary of Defense Archive). Background: The Law Governing the Treatment of Certain Senior Commanders of the Armed Forces went into effect after it was ratified by President Abdel-Fattah El Sisi and published in the Official Gazette edition dated July 25, 2018. It had been submitted initially by the cabinet as a draft to the House of Representatives on July 2, 2018, then marked up and discussed in committee discussions on July 3. After being amended slightly, the draft law received preliminary approval in a vote that same afternoon. It was ultimately approved in a final vote on July 16; only eight parliamentarians voted against it. 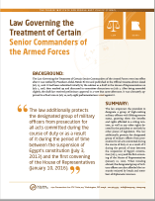 Summary: The law empowers the president to designate a group of high-ranking military officers with lifelong reserve status, granting them the benefits and rights afforded to a sitting minister, as well as any other rights decreed by the president or set forth by other pieces of legislation. The law additionally protects the designated group of military officers from prosecution for all acts committed during the course of duty or as a result of it during the period of time between the suspension of Egypt’s constitution (July 3, 2013) and the first convening of the House of Representatives (January 10, 2016). When traveling abroad, the designated group of military officers are also afforded the immunity enjoyed by heads and members of diplomatic missions. Significance: The law empowers the president to designate a group of military officers with lifelong reserve status without any set guidelines, effectively allowing him to reward individuals who are loyal to him with the promise of immunity and punish those who do not show sufficient allegiance. Once a designation is announced, any officers who are protected by it will enjoy lifelong immunity for the violations they may have committed during one of the country’s most significant transitional periods, which includes events like the Republican Guard clashes and the dispersals of the Raba’a al-Adaweya and Nahda Square sit-ins. Per this law, a high-ranking officer who may have otherwise been tried for being involved in ordering the dispersal of the Raba’a sit-in, for example, would be protected from prosecution for a lifetime and afforded benefits that include diplomatic immunity. With accountability for human rights violations central to any future reconciliation process in the country, this law eats away at the possibility of resolving some of the most deep-seated tensions in society and contributes to a systemic culture of impunity. An additional effect of the law is the bar that it places on military officers seeking to run against the president; although the law does not explicitly address the matter, a separate Egyptian law prohibits any military officers with active or reserve status from running in the presidential elections. Legal Context: Impunity for violations committed by government and security sector officials continues, with prosecutions for such violations rare and fact-finding committees tending to absolve officials of any wrongdoing. Despite a clear constitutional requirement to do so, Egypt’s parliament has not yet issued a law governing transitional justice. Political Context: This law was introduced and voted on around the fifth anniversary of the period which witnessed the suspension of Egypt’s constitution and the ousting of former president Muhammad Morsi, at a heightened time of nationalistic sentiment and continued support for the country’s armed forces. Additionally, this law was passed in the wake of an unsuccessful attempt by Sami Anan, former chief of the general staff of the armed forces, to run against President Abdel-Fattah El Sisi in the 2018 presidential election. Adherence to Legal Norms: This law introduces amnesties—one of the most controversial mechanisms of transitional justice—to a select group considered to be the “victors” emerging from a period of transition and for a lengthy period of time without any caveats for even the most serious international crimes. The blanket nature of this amnesty, its selective application, and the context in which it arises raises serious questions on Egyptian authorities’ commitment to justice. By failing to grant amnesty to both military officers and civilians alike, the law violates the country’s international and domestic commitments to protect citizens from discrimination and to guarantee equality before the law. Further, by writing away the rights of victims to hold certain military officers accountable for violations perpetrated against the victims, the law fails to honor the constitutionally guaranteed rights of victims to litigate. Implementation: At present, there is no information available about implementation of the law. Text of the Law: A link to the official text of the law is available here.